If you're tired of air-conditioned Bali transportation, and if you want to travel like a local, then it's time you tried riding a bemo. 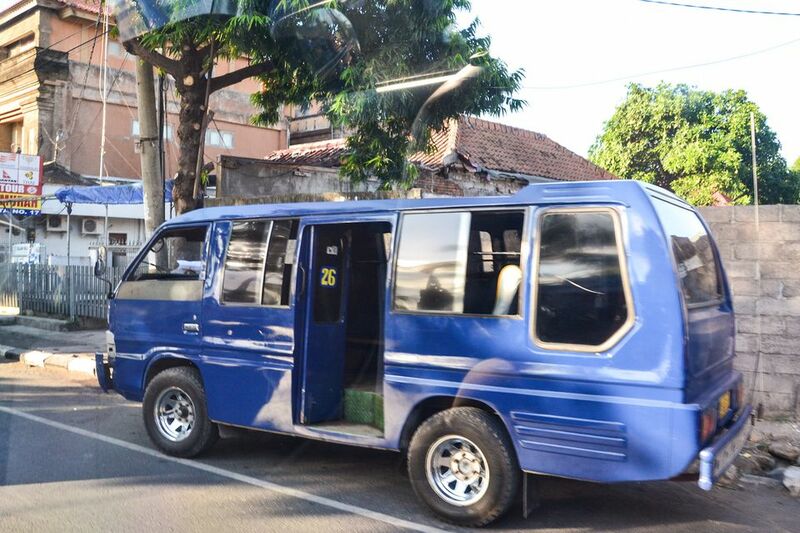 "Bemo" is the generic name for Bali's ubiquitous open-air minibuses, also called "angkot". Bemo are small enough to negotiate the narrow roads that connect Balinese villages, and are cheap enough to accommodate locals on a regular basis. A bemo is a van or a microbus with all the seats taken out; in place of the seats, a double row of bench-like seating is arranged on either side of the van, the passengers facing one another. Passengers can get in and out at any point of the route. These bemo travel on a set route dictated by the local government, and are color-coded according to their assigned route. Don't expect even a minimum of luxury when riding a bemo. Passengers from all walks of life bring livestock and other market goods with them on the bemo, so you might find yourself seated next to a live chicken or two. You can ride a bemo straight from the airport to your hotel in South Bali. To do that, you'll need to walk out of the airport, head in the direction of the domestic terminal and exit to the airport road. Bemo outside of the airport head to Kuta, then end up at the bemo terminal In Denpasar (Tegal terminal). The most famous bemo stop in Bali is a backpacker institution - "Bemo Corner", where Jalan Legian and Jalan Raya Kuta meet (location on Google Maps), is a popular transportation stop for budget travelers heading to Denpasar. Riding a bemo is simple. When you see one coming down the road, raise your hand. It'll stop for you and you can get on. It's that easy. Once on board, tell the driver where you want to get off. You'll then pay your fare. Balinese locals pay IDR 4,000 up to ride a bemo; if you're an obvious foreigner, it'll cost you more. Bule (foreigners, generally white foreigners) are routinely charged more for services in Bali. Luggage also costs extra, unless it can fit comfortably on your lap. Bemo routes are incredibly complicated and reach into most towns in Bali. For starters, let's look at three major bemo terminals in Denpasar, and the destinations each terminal services. Bemo generally start running very early in the morning, and start signing off in the late afternoon; the last bemo head back to their garages at 8pm. Before hailing your first bemo, do keep the following tips in mind. If you're just traveling near Kuta or Denpasar, get a taxicab instead. Reserve your bemo trips for visits outside South Bali. Bemo drivers ask for a much higher rate from tourists, but are amenable to negotiation. Keep your valuables on your person at all times; you might not be able to see your bag throughout the trip (as it may be stowed on the roof or elsewhere if size does not permit). Check if you need to transfer bemo at a certain point in your trip. Ask at the bemo terminal before you ride.